For process control, the MoistureScan is well qualified for the job. Due to the physical measurement principle, the water content in the cake is measured not only on the surface, but at the core as well. A falsification of the results of measurement by enviromental influences, e.g. foreign light, color change in the product (multi colour panels!) or density variations does not take place. This makes it possible to dye the wood fibers without affecting the accuracy of measurement (see illustrations). 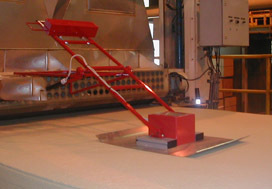 In order to ensure an optimal reciprocal effect between the sensor and the product, the sensor is led on a carriage across the cake. Due to storage with counterweights, the contact pressure is minimal and the surface of the cake remains unimpaired.